Over 10,000 people protested against fascist ‘Tommy Robinson’ (TR) in central London on Sunday. Originally published by United Against Fascism. The march well outnumbered Robinson’s “Brexit betrayal” demo, which was called with UKIP. It was a big step forward from previous occasions when Robinson’s forces have been bigger than anti fascists. It clearly demoralised some of the far right right elements present such as the thugs of the so called Democratic Football Lads Alliance, as this post reveals from their private Facebook wall, from a leading DFLA supporter. “Only about 6k on our Brexit Betrayal demo. Smaller than when it was just DFLA and UKIP, and tiny compared to the FLA days. What went wrong? Our side is going down and the reds are getting bigger ffs”!! The unity of Robinson’s fascists and the racists of Ukip was smaller than the unity of anti-fascists.But with the Tories in crisis over Brexit, the far right aim to deepen their forces. Trade unionists, students, anti-fascists, socialists, women’s groups, Labour members, anarchists and others joined the counter-protest. It brought together Stand Up To Racism (SUTR), Unite Against Fascism (UAF), Momentum, Stop Trump and dozens of other groups. Protesters chanted, “Black and white, unite and fight,” and, “Any time, any place – punch a Nazi in the face,” as they marched down Regent Street from Portland Place. Author Paul Mason said the Nazis “want to capture all the anger in British society”. “To stop them we need unity,” he said. Ukip leader Gerard Batten shared a stage with Nazi Tommy Robinson. A “Brexit Means Exit” march organised by Robinson and Ukip brought 5,000 people onto the streets. Although the banner of the right’s mobilisation was Brexit, the glue that held the different elements together was racism, and particularly Islamophobia. Robinson attacked the “Islamisation” of Britain. On the march people talked about moving out of areas because they were becoming “swamped” and describing Islam as “poison”. Crisis-ridden Ukip is attempting to realign itself with a growing far right street movement. Ukip sees Robinson as the junior partner, but it may get a nasty shock. Groups such as the far right Generation Identity were on the march. Throughout the day, DFLA thugs from various football firms such as Leicester, Chelsea and joined with ex Combat 18 thugs in attempts to intimidate anti fascists. They failed miserably. Some of the so called North East Infidels had traveled far but went away with nothing to show for their violent intentions. One of the main leaders of the DFLA clearly had a weapon ready to use but was not able, because of vigilant stewarding, to carry out his threats. Noticeably absent from the demo were many football hooligan firms from clubs such as West Ham and Millwall who clearly thought better of attending. Both sets of far right elements (who of course are a small minority among Lions and Hammers fans) have been the backbone of the DFLA and big fans of Robinson. Their near absence will worry Robinson and UKIP, in the latters’ efforts to bring together a street movement. As the quote above from a DFLA member shows, all is far from well in the DFLA, for now. The DFLA ends the year somewhat adrift and looking to shore up it’s islamophobic base. Moreover, Anne Marie Waters For Britain group were excluded from the far right gathering, according to this below. Such a split in the far right can only aid anti fascists. Clearly no love is lost between UKIP and the former leadership candidate. Ukip members had a recruitment operation asking people to join the racist party. From the stage Batten implored people to join. Robinson asked the crowd to join him in becoming a member of Ukip, as he went through the process on his phone on stage. However, his credit card was rejected! The far right tried to appear respectable – a stewards’ meeting at the start was told to take beers off people who were drinking. When Robinson’s cousin and ex EDL leader, Kevin Carroll saw a marcher soaking an EU flag in lighter fluid he made sure it didn’t go up in flames. However, several photographers were manhandled by ex EDL ‘stewards’ and told to ‘get out of our demo’ in none too friendly terms by various UKIP members and other racists. It’s important to keep calling him a fascist to prevent him posing as the champion of the working class. Sunday marked a good day for anti fascists. While our side left confident and determined, the far right, for all their online bluster, know this was not the breakthrough they’d promised supporters. They will have to answer, particularly in light of resignations from UKIP of leading members and Nigel Farage’s attacks on their leader, Batten, searching questions from those attracted to their message but unnerved by the nazis around UKIP. Over 200 people turned out on Sunday morning to protest against a threatened far right demonstration in Liverpool. The ‘Mersey Nationalists’ had called their protest in the city’s Derby Square for ‘anyone who can’t make it’ to fascist Tommy Robinson’s demonstration in London on the same day – but none surfaced. Speakers at the Unite Against Fascism Merseyside/SUTR protest included: Liverpool City Councillor Anna Rothery; FBU North West Regional Secretary Mark Rowe; NEU North West Regional Secretary Peter Middleman; UNISON North West Regional Convenor Paula Barker. Merseyside Together were also present throughout. Anti-fascists also danced to music in Derby Square, and held a march to nearby Exchange Square. Liverpool City Councillors: Alice Bennett, Paul Brant, Patrick Hurley, Barry Kushner, Steve Munby, Ann O’Byrne, Liz Parsons, Liam Robinson, Anna Rothery, Nick Small, Jeremy Wolfson. 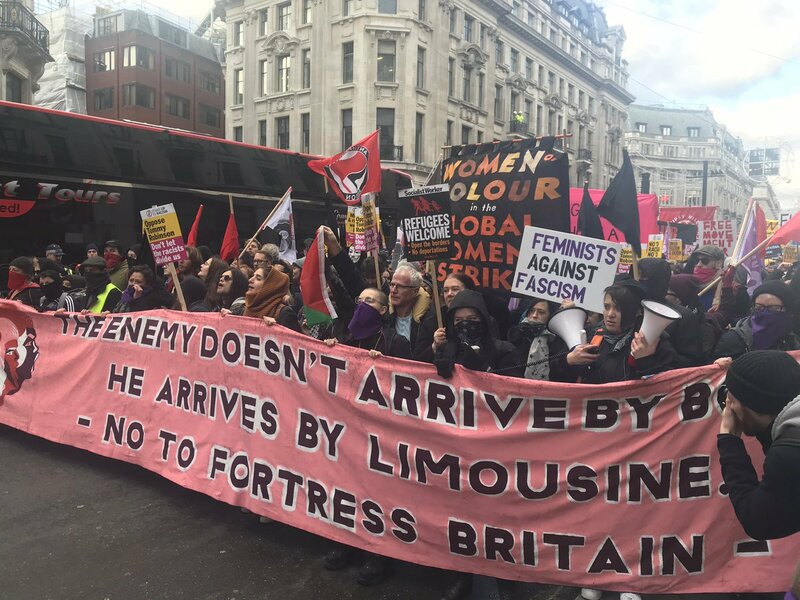 It was an excellent united front and, as in London, bodes well for anti fascist unity in action in 2019. Hats off to all anti fascist this weekend!